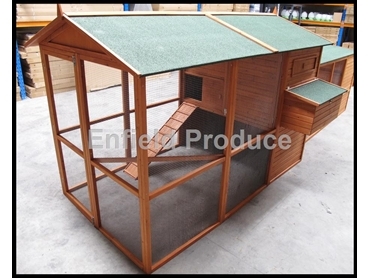 The Sun-3033 Jumbo Chicken Coops from Enfield Produce : Pet & Garden Supplies (Sydney) have been designed to provide a well sheltered space from extreme weather conditions. The walk-in height of the Jumbo Coops allows easy entry while a durable asphalt style material covers the whole roof for protection from the elements and durability. The enclosed area has a metal tray that pulls out from the back. These coops are pre-fabricated and include four pages of instructions. No drilling or cutting is required. The only tool needed is a screw-driver to put the pieces together. However, the assembly of these coops will require a second person to hold parts together while the other person uses the screwdriver. While designed for anyone to put together, these chicken coops are a little more complex to assemble than typical timber coops due to their larger size and extra number of components. Endfield Produce can organise someone to deliver and install the coops in the Sydney Metropolitan area (delivery and assembly charges apply).